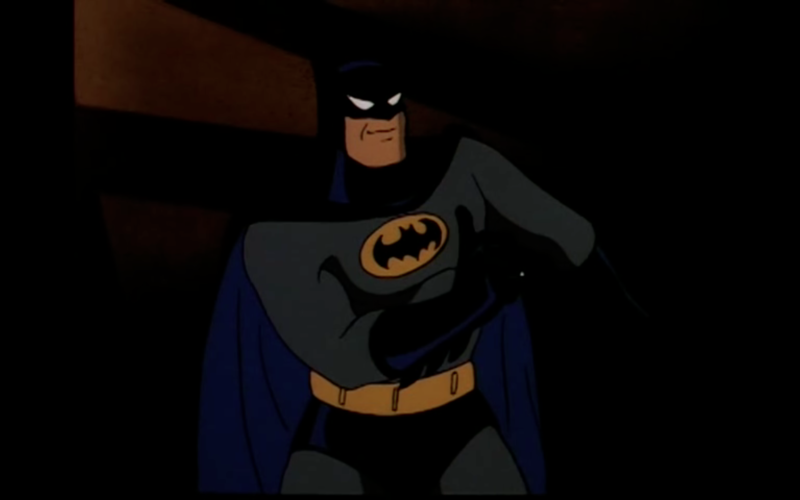 Every Wednesday for the next few weeks, I will be sharing a screen capture from an episode of Batman: The Animated Series. I dearly love this show, and watched it as an impressionable child. Some of the frames are stunning, some have errors, and some are just odd. I don’t own these images and I’m not getting anything for this except happiness. Please enjoy. What’s the episode about? It’s about the Underdwellers (read: Morlocks), a society of orphan children who live under the harsh rule of a Fagan-type evil leader in the sewers of Gotham. The Sewer King lives underground (like the Rat King from Teenage Mutant Ninja Turtles) owns trained alligators (like GI Joe’s Croc Master) and has an eyepatch (like Callisto, leader of the Morlocks). There is very inconsistent use of sunlight as both a painful punishment and later as a comfort for the children when they return to the surface. It is not a good episode. When Does This Frame Happen? Towards the end of the episode, a child morlock swoops in and rescues another child morlock from the arms of The Sewer King (who looks like Captain Hook). Why Are You Sharing It? Batman’s a pretty stoic guy, but because the kid just gave Batman the thumbs up, Batman mimics the gesture. It’s so unlike him. If it weren’t such a dark picture, it could be a meme. This new endeavor is going to take a long long while… are you sure you want to do that? And actually after a few seasons that show suddenly got a lot more tame and dull, I just never noticed it since I was a kid :/ But some episodes were pretty impressive, considering it was a kids show.